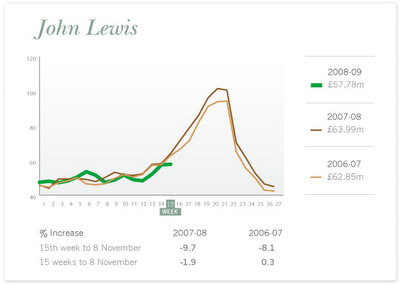 UK retail sales: "a strong result in handbags"
If anyone still believes that job cuts have nearly run their course in the UK they ought to take a look at the weekly sales data from the John Lewis Partnership, think twice and hope it's a blip. "a strong result in handbags"
"enhanced candleshop...continued to put on significant advances"
"best week ever for Wii sales"
"high-definition televisions and Blu-ray DVD players took a leap forwards"
With commentary like that it's hard to work out where the 9.7% decline came from. In fairness, the total numbers (these are just those of the department store division) were better (off -4.1%) thanks to a strong performance from Waitrose supermarkets. This was due in large part, according to the group, to its "wine promotion'' although it's not yet clear if that's where the growing redundancy cheques are being spent. If prior years mean anything, that would be week 1 of Christmas. Woops!